Well there you have it. You’ve always wanted to know what it all means and now you know. But now, what does that mean? First of all, seeing an object is very different from looking at an object. Looking at an object is little more than noticing its existence. This cannot help the artist. Seeing is more of a visual understanding, where you and that object of observation become one. Many teachers of beginning acting classes make their students become trees, flowers, and rocks. Often these exercises become jokes and the student receives no benefit from the exercises. The point of this exercise is to let us be one with an object, to have empathy with an inanimate object. The point is often missed by both teacher and student. Why should we have understanding with a rock or a block of wood? Well in Tao, the uncarved block of wood is an important symbol. It indicates what is hidden, what needs to be uncovered, discovered. The sculptor does not carve just anything from the wood. He uncovers its true nature. We need to uncover our own true nature. One of the ways to do that is to truly see another person. Here is a oneness exercise. Stanislavski used to build his characters up from his shoes. How his characters stood and moved around in space was the basis for everything his characters did. When I was in New York, as I rode the subway, I used to look at the soles of a person’s shoes. From the wear on them, I would try to imagine how that person would walk. Did that person wear down his heels first as he stomped on the ground? Did he wear out the outer sides thereby making him bowed-legged? Were the insides thinner than the rest of his shoes making him shuffle as he walked? From there I would look at the quality of his shoes. Was he rich, comfortable, or poor? Depending on the time, I would work my way up from the shoes, trying to take in every piece of clothing on that person and imagine what kind of influence it had on him. I would often follow that person as he left the train, studying his gait and trying to become one with it. As my walk became more and more his, my thinking started to change to his thoughts also. It was then that we parted company but I continued to think and move as that person. I imagined what my home-life would be like. Did I dread going home? What kind of place would it be like? Who would be waiting there for me? Soon I had a complete understanding of a person that I had never spoken to but only observed. This was not a test. I didn’t have to ask that person what he did or was he married. I had a deeper understanding of what made that person whole. Try this exercise yourself when you are in a crowded room. Pick someone who you do not know and go for it. Catching a Glimpse of the Ox. The splendid head decorated with stately horns – what painter can reproduce him? The boy hears a pure beautiful sound and follows it. It is in this way that he can see into the nature of things. The six senses (sight, sound, smell, taste, touch, and mind) merge and he senses a harmonious unity. This is in all his activities. It is a unity like salt in water or color in dye; it is distinct but indistinguishable from the whole. When the mind is clear and quiet it is indistinguishable from himself. It is the realization that his inner nature is the spiritual truth. At length you have had an enlightenment type of experience. But you only see the Ox’s tail and heels. The parts are clear but not the whole. If you are asked about your experience, you cannot give a clear answer. You cannot afford to relax at this point because even though you know that enlightenment is just around the corner, you have not experienced it completely. In the actor’s life, enlightenment can be likened to having a role in a play. During the performance you have no sense of time. You are in the moment. You are not aware of your breath, but you breathe. You are not aware of your volume, but everyone can hear you. Everything is working beautifully. You are inspired. But at this point you do not know how to duplicate the feeling. In rehearsal, you have not quite found the character. You can hear your character’s voice or see his walk. Many parts are becoming clear, but the big picture is not complete because you have not yet fully realized your character’s true nature. Even though you have heard it many times, you still do not fully believe that who the character is, you are. You are one in the same. Your character’s truth is the same as your truth. You would walk, talk and act as he does in similar situations. You are one with the character just as we all are one with each other. Life is wonderful. It affords us so many opportunities to see the truth. Pick up a flower and it is there. Look at a sunset and it is there. Understand your true nature and it is also there. We just have to be ready to accept the truth. And we have to accept that there is more than one right path. Every path is the correct one to follow. There is no wrong path. The only path that is false is the one we do not follow with an open mind. Pick up an ordinary object and start to describe it. Make your description as complete as possible. After you have completely examined it in the normal way of looking at things, turn it over and describe it in an abnormal way. Look at it as if you didn’t know its exact use. If you are examining a watch, for instance, put it in your mouth or on your head. You are not looking for different uses, you are experimenting with the act of exploration. There is an old improvisation called, “A pencil is not a pencil.” Take a group of objects and place them in front of three or four actors. Their job is to use each object in a new and different way. Not the way it was designed for. A pencil could become a flute, or a telescope, or a arrow. The exercise is timed, and the actors have to come up with as many possibilities as they can. This can be played like a competition between two or more groups of actors. The point is to open your eyes to a whole world of possibilities. You need to live your life with your eyes open like a child. See the wonder in every moment. See the possibilities. Never deny the validity of another’s or your own creativity. Always follow your heart. And most of all, do not waste a precious second of your time on this earth because time always runs out. I want to thank all of you who have been following this blog. 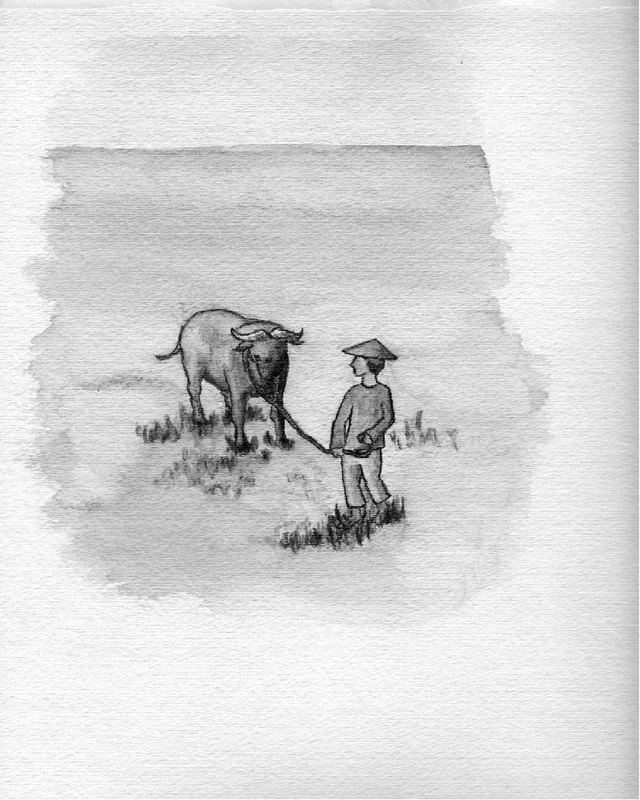 Riding the Ox Home, a Zen approach to Acting. I’d love to hear your ideas and comments. Don’t be stupid. Don’t be steadfast. Life is about change. If you always have to insist on your point, you are probably wrong. If you find it hard to take other people’s direction or criticism, this is probably not the profession for you. I once knew of a director who would purposely give incredibly dumb directions at an audition. “I liked the way you delivered that monologue, but could you do it like a chicken?” Besides having a really good time, he was testing the actor. He wanted to see if the actor could follow directions, no matter how stupid. The best “chickens” were cast and never once had to cluck during rehearsals or performance. And speaking of rehearsals, the rehearsal process is an exploration. How can you explore anything if you are not willing to look at the other possibilities? Always approach direction with an open mind and try to accomplish it to the best of your abilities. You never know what the director is really looking for. Keith Johnstone talks about status in his book, Impro. Status is how you feel about yourself. Low status people feel insecure. High status people feel secure about themselves. This is not saying anything about how good or bad the person is. I’ve known many high status people who were completely unenlightened individuals. If you never read his book, you should. Status is a very efficient way of approaching character. Decide upon what status you would think your character would be. Play the scene as either a high or a low status person. Some things probably felt right, some others didn’t. Now reverse the status. If you were insecure, now play the scene as if you were very comfortable. You will probably find other places in the scene which now feel good. How can a person feel both secure and insecure in the same scene? Well, don’t we all change our own status a hundred times a day? We get up feeling great and we get to work and someone says something stupid. Our status goes from high to low almost immediately. The reverse can happen also. In fact, the most interesting characters are constantly changing their status. This is the struggle that is most interesting to watch, the struggle within ourselves. So if you believe one thing about your character, the reverse is also true. Never tell the director, “My character wouldn’t do that.” He probably would. And if you can play it fully, truthfully, it will make your character much more interesting.